Nowadays, there are dozens of feature-packed voice communication applications to choose from. One of such applications is Skype which has a huge and loyal user base. It's my personal favorite too and I often use it to communicate with my clients. If you frequently use Skype with your friends and family and want to make it a bit more fun, a voice changing plugin can be used to surprise the person on the other side of the call. It can also be used when you do not want to reveal your identity while talking with a stranger. 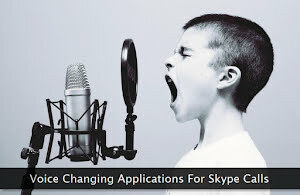 I've shortlisted some of these voice changing applications which easily hook into Skype. Here, I'll strongly advise you to use these applications in a responsible manner. You can pick the one you think gives the best voice changing options that fit your needs. You'll need a desktop Skype application to use these plugins. I've tested these voice changing applications on a Windows 10 PC and each one of them worked as intended—without any issues. Let's quickly check out these Skype voice plugins—one by one. Though our emphasis is on Skype, most of the applications listed below work flawlessly with other voice communication platforms too. If you're using a different one, do test these plugins on that one too. Let's not wait further and once go through these powerful and user-friendly voice changing applications to make our Skype session—a hilarious one. So, here we go! 1. Skype Voice Changer - This real-time voice changing application is one of my favorites which works out-of-the-box. It's a small application without any kind of bloat. I've tested it thoroughly on my PC. It can also be used to record Skype calls which is a very handy feature for the majority of users. Tweaking and customization of changed voice are supported to meet the user's need. Pre-recorded sounds can also be played during the live voice call. A user can also use Windows Speech Synthesizer with this application. 2. Voicemod - Apart from Skype, this application also works with several popular gaming and messaging apps. It has a nice interface which makes it very attractive to use. And, best of all, it's totally free! It also provides a powerful SDK for developers to help them integrate it with their messaging applications. It has support for over 3 dozen voice effects which can be fine-tuned as per your requirements. It's efficient and works seamlessly on low-end systems too. It also works flawlessly on smartphones and tablets. 3. Clownfish Voice Changer - This voice changing software can be used by any application that uses system audio device and Skype is no exception. Its setting options are very simple-to-use, even for a layman. Apart from pre-defined voice pitches, a user can create a completely custom voice pitch too. It also has text-to-speech support. One can also add secondary background audio to the voice calls. The application sits nicely in the taskbar tray where all the options are easily accessible through a context menu. 4. AV Voice Changer - This is a professional-grade and advanced voice changing application for Skype. It can work with any VOIP-enabled web chatting application. The interface is also excellent. It has one of the biggest libraries of various types of voice effects one can use during a Skype call. It also has a powerful voice editor to fine-tune various attributes of the changed voice. An integrated voice recorder is like icing on the cake. Hotkey support enables you to access key or frequently used features with ease. 5. Voxal Voice Changer - This is a time-tested, popular, and stable voice changing application packed with all the important features. It has both a premium and a free version for non-commercial usage. It's a lightweight application and runs smoothly on older systems too. This application enables you to create unlimited custom voice pitches to use with your calls. All the custom effects can also be applied to prerecorded voice files. Audio previews help you analyze the change before using it in the voice call. 6. MorphVOX Pro - This application not only changes the voice but also adds a custom background audio to the chat session. Its noise cancellation system gives you high quality voice calling experience. It has rich support for plugins to add various kinds of effects to the voice call. All the application settings can be easily backed up and can be imported on a different system to quickly use the user-defined custom settings. Its carefully crafted vintage interface takes you back in time and makes you nostalgic. 7. AthTek Voice Changer - The last one in this list is another good voice changer for the Skype calls. The configuration and use of this application are dead simple. It works without any issues on older systems too. If you're planning to purchase its premium version, I'll suggest going with the Skype ID license. It'll work on any computer for a lifetime. The machine ID license may not work if your computer malfunctions and stops working in the future. Beginners can use the extensive help documentation of this application.